Yala peak, is situated north from Kathmandu near to the border of Tibet (China).this is one of the easy lowest trekking peak in Nepal. Drive from Kathmandu to Dhunche about 7 to 8 hours by bus and We flow the trekking route of Lang tang valley on till Kyangjin Gompa. From Kyangjin Gompa you will pass through the Airport then you turn to the north. This peak offers you the spectacular view of Langtang Lirung, Langsisha Ri, Gangchepo, Dorche Pakpa and Naya khanga. Arrival and pick up from the international airport in Kathmandu, after some refrershment we will invite you for a traditonal Nepali dinner. Drive from Kathmandu to Dhunche (1966m.) which takes about eight hours. You head north out of Kathmandu driving through scenic foothills and ridgeline vistas to Dhunche. The first part of your drive to Trishuli Bazaar is quite smooth. The path now moves along the gravel road. During the rainy season, the way is sometimes blocked due to landslides. Your drive from Kathamandu to the destination is to be made by either local bus or land cruiser. From Dhunche the trail turns east down the village’s main street, using one or two short cuts to avoid the longer dirt road loops, crosses the TrishuliKhola and follows the contouring road to the village of Bharkhu. Climbing steeply from Bharkhu the trail reaches a ridge where we enter the Langtang valley. From here there are views north to the snow peaks in Tibet and, to the east; the top of Langtang Lirung can be seen. Descending, we come to the village of Syabru strung out along a ridge. The main trail to Langtang descends along the ridge, through the village and then continues the descent to the Langtang Khola. We follow the river, climbing though uninhabited forest of oak and rhododendron alive with birds. Passing the single dwelling of Chongong we climb along a steep trail to our camp in the forest. As we continue climbing there are occasional glimpses of Langtang Lirung between the trees. At Ghora Tabela [3000m], the trail emerges into open ground. There was once a Tibetan resettlement project here, but now it is a Nepalese army post though it has no permanent inhabitants. The trail continues to climb gently and the valley widens, passing a few temporary settlements used by herders who bring their livestock up to graze in the high pastures during the summer months. There is a monastery which we can visit shortly before arriving at the village of Langtang, the headquarters of the LangtangNational Park. The houses of Langtang and neighboring villages are of Tibetan style, surrounded by stone walls enclosing fields of buckwheat, potatoes, wheat, turnips and barley. The trail climbs gradually through small villages and yak pastures as the valley opens out further and the views become more extensive. After crossing several small streams and moraines, the trail reaches the settlement at Kyangjin. Here there is a small monastery and a government-operated cheese factory. 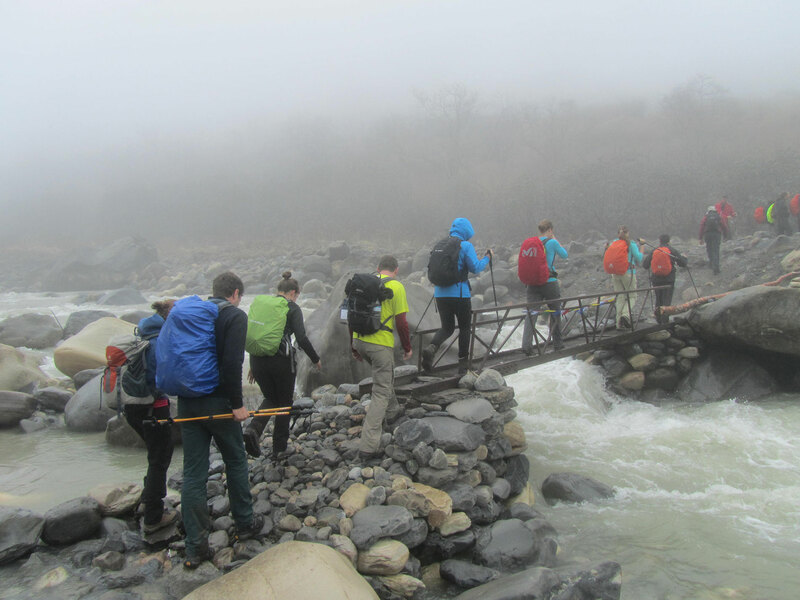 We should arrive at Kyangjin by lunch time allowing time to acclimatize and explore the area. A day to rest, acclimatize and explore the area. Near the village, visits can be made to the monastery and the cheese factory. We may walk up the moraine to the north where there is a spectacular view of Langtang Lirung and its hanging glaciers, or climbKyangjin Ri, just behind the village, for a superb all round panorama. From Kyangjin we continue further up the valley, climbing above the Langtang Khola and contouring around the hillside to the yersa at Yala. From our camp here there are tremendous views towards the peaks of Dorje Lakpa (7000m), Kangchenpo (6400m) and Lonpo Gang (7100m). From our camp at Yala it is only a short way to the top of Tsergo Ri [5066m]. This is an ‘easy’ walk to the prayer flags and mani stones marking the summit, the highest point on a broad flat plateau. The views all around are spectacular, a 360 degree panorama of snow capped peaks including Langtang Lirung, Kimshun, Yanza Tsenji, Langtang Ri, Pemthang Ri, Langshisha Ri, Dorje Lakpa, Kangchenpo and Naya Kanga. Our base at Yala provides us with the opportunity to climb Yala Peak, a glaciated peak to the north east of Yala. The climb is not difficult and provides good acclimatisation. The climb is straight forward being little more than a walk up steep snow slopes of around 30 degrees. Ice axe and crampons will be needed and most of the climb will involve walking roped together up the glacier. This climb is a superb introduction to mountaineering in the Himalaya with magnificent mountain scenery all around and views across to the mountains in nearby Tibet, including Shishapangma. We continue retracing our steps to Syabrubensi.